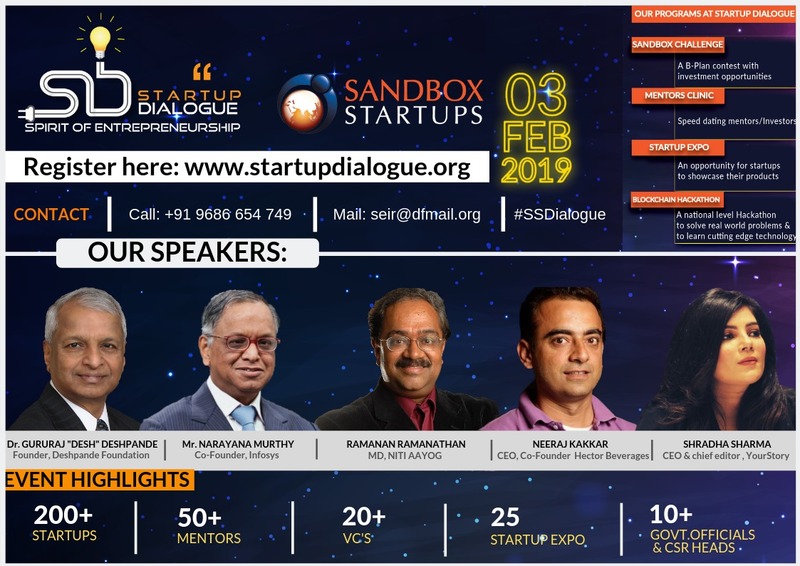 Sandbox is inviting you for Startup Dialogue 2019 to be held on 3rd February. The event will bring together 250+ Startups, 20+ Inspirational speakers, 50+ Mentors, 20+ Investors, and over 200 students. The guest includes Mr. Narayana Murthy (Founder, Infosys); Dr. Gururaj ‘Desh’ Deshpande (Founder, Deshpande Foundation); Mr. Ramanan Ramanathan (Mission Director, Atal Innovation Mission) Ms. Deepa Cholan, DC-Dharwad, Mr. Neeraj Kakkar, CEO, Paper boat and Shradha Sharma, founder YourStory. Participate in this event and also forward this in your Entrepreneur / Startup network as it can immensely benefit startups.